Is Collaboration the Solution or the Problem? As accounting and advisory firms become more integrated with multidisciplinary services, there’s been a stronger focus on internal collaboration – the sharing of knowledge and information – to improve the delivery of services to clients. For example, it makes sense that if the accountant and the financial planner are talking to each other about a mutual client, the client is going to get a more valuable service. Collaboration also extends to internal communication, where staff share technical information as well as ideas and thoughts about process improvements. Cloud services such as slack and hipchat are being used in effectively when people in separate physical locations need to be able to communicate effectively with each other. A recent HBR report ‘Collaboration Overload’ noted that over the past two decades, the time spent by managers and employees in collaborative activities has ballooned by 50% or more. At the same time, it’s been difficult to identify a tangible financial benefit from collaborative activities. Some challenges are appearing that are forcing businesses to really question the value of these activities. Both productivity and performance can decrease as participants are buried under an avalanche of requests for input or advice, access to resources, or attendance at a meeting. Recent research in over 300 businesses worldwide has shown that the distribution of collaborative work is often extremely lopsided. In most cases, 20% to 35% of value-added collaborations come from only 3% to 5% of employees. As people become known for being both capable and willing to help, they’re drawn into projects and roles of growing importance. Their giving mindset and desire to help others quickly enhances their performance and reputation. However, they also run the risk of becoming institutional bottlenecks. Work on projects doesn’t progress until they’ve weighed in. Worse, they are so overtaxed with different conversations and projects that they’re no longer personally effective. What’s happening in accounting and advisory firms in the collaborative space and is there any evidence that it adds value to communication and workflow? Where information is siloed and communication between departments is limited, the simple act of talking to people can provide significant value, particularly if it’s directed towards specific clients or business opportunities. When collaboration requires group meetings, the objective of the meeting needs to be clearly identified up front. Sometimes, simply sharing information is enough. At other times, a process of discussion and negotiation is required for a successful outcome. When people work in geographically separate locations or in different time zones, online collaborative tools such as skype and slack are essential for the effective sharing of information and knowledge to drive workflow and develop client relationships. Cloud accounting software provides, in theory at least, the opportunity for clients and their advisors to share information and assist with decision making. In reality, very few accounting firms really engage their clients well in this way. Client relationship management (CRM) systems allow for the sharing of data and other information, meaning that anyone in the firm who needs this information can access it readily. However, the value of CRMs is directly proportional to the quality of information available, which in many cases is severely constrained by data collection processes. For technologies (predominantly software tools) to create real financial returns, they need to be accompanied by thoughtful changes in the way work is done – in the behaviour of individuals and teams. In most cases, it’s simply more effective to get up out of the desk and go and talk to someone than to use an online communication tool to share ideas and thoughts. A common complaint about collaborative processes are that they result in too much talking, not enough doing (or more hugs than decisions). Sometimes it’s simply better to make a decision and move forward rather than expect that everyone remotely relevant should have their say. Collaboration can create a sense of common purpose, but can as easily water down tough decisions that need to be made for businesses to remain competitive and profitable. 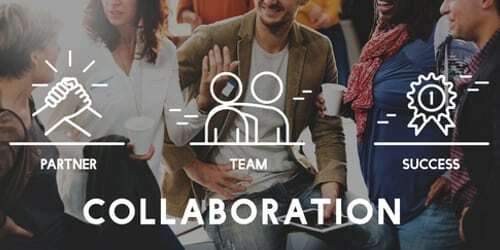 Collaborative work seems to work best for businesses that need to solve problems across different divisions, where innovation is important, where cross-pollination of ideas improves the output, where turnaround time is crucial, and where getting people to co-own the solution will create a better outcome. So, should accounting and advisory firms be focusing more on the use of collaborative tools and processes to drive the exchange of information and thoughts? Certainly where sharing results in a better service or stronger productivity, the answer is a clear yes. However, when they’re simply established to encourage a feeling of inclusiveness and connectedness, leaders should be wary. There are simpler and more effective ways of achieving this result. 5. Direct collaboration with clients through the sharing of financial data, so that better strategic and operational decisions can be made. As a leader, you should be looking for ways to help your people engage more with each other in real time, rather than simply focusing on the job at hand with a production line mentality. The best place to start is to ask your people, and your clients, how day to day collaboration could be improved to deliver better results for them.